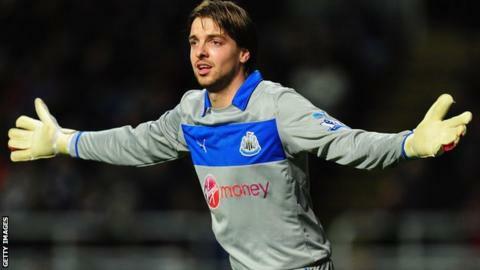 Newcastle United goalkeeper Tim Krul will be out of action for up to five weeks after suffering an ankle injury. The Netherlands international picked up the injury in the Magpies' 1-0 victory against Ukrainian side Metalist Kharkiv last week in the Europa League. "His ankle is still a little bit swollen," said Newcastle manager Alan Pardew of his 24-year-old keeper. "We think he will be out for a maximum of four or five weeks, but we are hoping for less than that." Krul, who has played 26 times for Newcastle this season, was left on crutches after the game following striker Jonathan Cristaldo's challenge. With reserve goalkeeper Steve Harper, 37, struggling with a back problem, 26-year-old Rob Elliot made his Premier League debut in Newcastle's 4-2 win against Southampton on Sunday. The Magpies are 13th in the Premier League and Krul could miss games against Swansea, Stoke, Wigan and Manchester City as well as both legs of their Europa League last-16 tie against Russian side Anzhi Makhachkala. Newcastle could also be without captain Fabricio Coloccini for their trip to Swansea on Saturday after he suffered a back injury against the Saints.